Christine Bunting, Head Curator UCSC Special Collections. * Do you own a work of art by Dan Stolpe? By donating such a work to the UCSC Library, you may be able to extend our Archive of images and, if the work’s value has appreciated substantially, help yourself to a significant tax deduction as well. If we already own a copy of the image, with your permission, we may be able to translate your gift into a significant addition to the Stolpe Endowment. * Please consider making a cash contribution to the Stolpe Endowment, which is building to the $10,000 level required for endowment investment by the UC Santa Cruz Foundation. We respectfully request a contribution of $500, but any amount you give will be welcome and appreciated. Please send your check made out to the UCSC Foundation/Stolpe Endowment to Gift Administration, Carriage House, UC Santa Cruz, 1156 High Street, Santa Cruz, CA 95064. * Consider a gift of appreciated securities to the Stolpe Endowment. Again, such a gift may provide substantial enrichment to the Endowment, as well as significant tax advantage. For specific information on how to make such a gift, please contact Library Development Officer Margaret Gordon at 831-459- 4211. We will notify Dan Stolpe of your generosity and, in appreciation, enroll you on our honor roll of supporters, inviting you to special library events and activities. 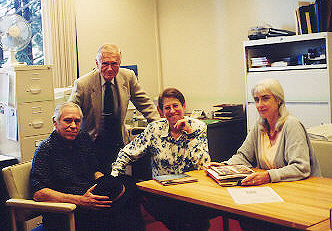 Most important, you will have the satisfaction of knowing that you have helped ensure the continuing vitality of the Daniel Stolpe Archive and Dan’s enduring legacy. McHenry Library Special Collections maintains Mr. Stolpe's art archive. The McHenry Library Media Center has had the privilege of displaying examples of his paintings, lithographs and woodcuts since 2001. Local art collector and dentist, Dr. Ron Wickum, is remembered by his generous donations of art by his close friend and acclaimed artist to University of California Santa Cruz Special Collections. Coyotes have settled in the back hallways of McHenry Library--coyotes digging for bones, chasing the moon, scratching fleas. These coyotes are the creation of Dan Stolpe, an internationally renowned artist and longtime resident of Santa Cruz. 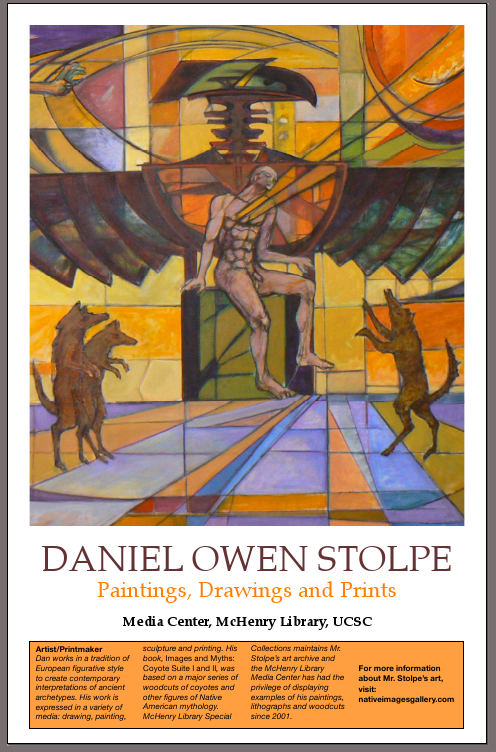 Stolpe's woodcuts, lithographs, and etchings of coyotes and other Native American figures are found in more than 25 major collections around the world. Those collections now include UCSC, thanks to a gift from Dr. Ron Wickum, a Santa Cruz resident. 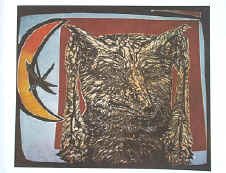 vision and corpus of North American shamanistic painter, printmaker, and sculptor Daniel O.
Stolpe canon, as well as Dan Stolpe’s complete personal papers and relevant memorabilia. robust and vital institutional environment.